Having a schedule for the days of the week, not of what to do when, but of what things to try to finish in a day has really helped me with schooling the kids. Oddly enough though, I forgot to put blogging on my list of things to do every day and so yet again I've been neglecting this space a bit. But in the meantime, the kids have been learning. Math and English get done, as do science, history and religion. We've even managed to fit time for art. Now my kids will draw and create on their own without actual art studies, but without focus they usually don't get to try new techniques and they don't learn about particular artists. At the beginning of the year, I planned to use the book Discovering Great Artists to help us focus. In the first semester, we used the book once. In the past three weeks, we've studied three artists and the kids are loving it. We've learned about the Limbourg Brothers and their Book of Hours, studied Fra Angelico and we're learning about Masaccio this week. Not only are they learning about artists and their contributions to the development of art, but I'm remembering things I should have known all along. It's all well and good, for instance, to let the kids have lots of paper and drawing tools to mess around with, but a little instruction goes a long way too. When my four year old draws by herself her drawings look like stick figures with arms sticking out where their ears should be and my six year old sticks a line of blue sky at the top. When I sit with them and ask them questions about what the world really looks like, it is amazing what they see and can put down on paper. I ask them to look at my arm and tell me whether it is a line or if it has a top and bottom line. What does a hand look like? Do you see the sky all the way to the horizon? Their pictures improve and so does their ability to see on their own and interpret into drawing what their eyes perceive. The pictures above are their drawings of saints. 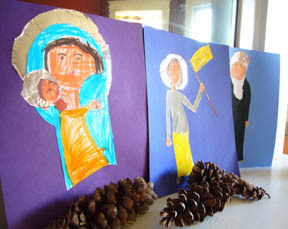 My four year old did the one of Mary and Jesus, the six year old drew Joan of Arc and the nine year old St. Benedict. It may be something best saved for when they are a bit older but I am completely fascinated by the combination of art, science and religion. It includes so many areas, from Newton to Copernicus and such... but each time I study those areas, I have some sort of reaffirmation of Faith. Sounds like a good book for my wishlist!